23 April 1979, local Asian youth and anti-fascists demonstrate against a meeting held by the far-right National Front in Southall, a suburb of west London. The demonstration is attacked by the notorious Special Patrol Group who use horses, batons and vans against the crowd. 350 people were arrested, and many were injured. Tragically, Blair Peach a teacher, was killed by the police. No officers were ever charged for their actions. The Southall Kids are Innocent was a benefit gig organised by Rock Against Racism (RAR) to raise money for those arrested at the demonstration. The Rainbow, back in day. 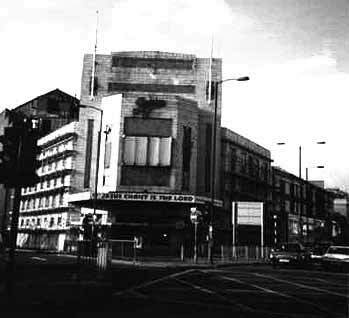 The gig was held over a weekend in July at the Rainbow Theatre in Finsbury Park, north London, it was one of the first concerts I ever attended. 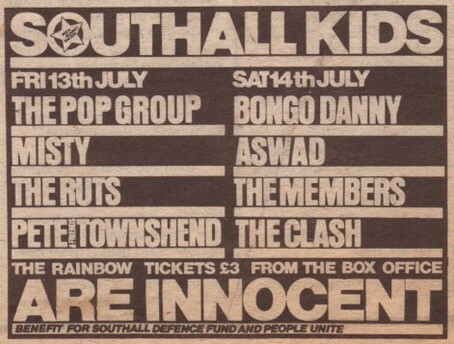 I can remember it was a hard choice between the two line-ups but my pocket money and parental consent was never going to reach to going to both nights! I was a huge Who fan at the time so Pete Townsend was an obvious attraction but it was the presence of the Ruts on the bill, a band I had come to love dearly over that summer, that finally tipped the balance in favour of Friday night. I went to the gig with my schoolmates, Seamus and Mitch. Entering the cavernous belly of the Rainbow I recall the sound of heavy dub thumping through the walls. People milled about the main foyer; punks, rastas, a few mods and the old skin chatting, posing, rolling up spliffs or supping pints. We made our way to the bar, clearly underage, we were served without a second glance. Clutching our drinks we ventured into the main auditorium. We caught the Pop Group mid-set and hated them straight away. Okay, 18 months later the Pop Group were one of my favourite bands (and still are) but we were snotty-nosed young punks just not ready for the punk/jazz/funk/noise fusion from Bristol’s finest. We gave them a couple of minutes before denouncing them as art-school wankers and making our way back to the bar for refreshments. This must have been one of the Pop Group’s first gigs in London and how I wish I had stayed and savoured that fantastic energy and fury. Ah, so young and so foolish! 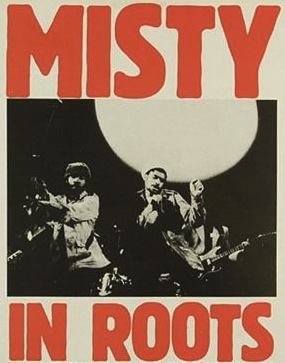 Then it was time for Misty in Roots, label mates with the Ruts. 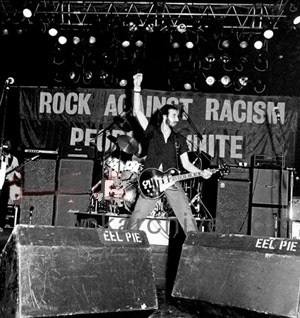 One of John Peel’s favourite reggae bands and regularly on the bill at Rock Against Racism gigs. The problem was I really didn’t like reggae. I had tried very hard over the previous twelve months but it just wouldn’t happen for me. So at RAR gigs, where it was mandatory to have a reggae band along with the punk bands (a good thing), I would always patiently sit out the thud, thud, thud of the dub, dub, dub. It took another twenty years for me to start to enjoy reggae, so I got there eventually. And now the evening really starts. The Ruts come on stage and start furiously and continue furiously and end furiously. Thunder and lightening punk rock, the most exciting young band on the scene and all mine, mine! Because yes, the Ruts were ‘my’ first band. Yeah, sure, I loved the Pistols, Clash and Buzzcocks but they had all been around a bit when I arrived on the scene. But The Ruts were just starting up when I threw my lot in with the holy punk crusade, we were in this together, MY band. It’s a swirling, throbbing mess down there at the front of the Rainbow, arms, legs, all a thrashing about, you fall over, a dozen hands reach down to pull you up, an elbow in the side, “sorry mate” and a grin. It was physical, fast and a little scary but everyone’s smiling and buzzing on the pure, unadulterated energy supplied by four lads from west London. 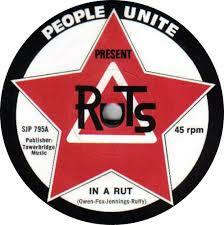 The Ruts. My band. The Ruts leave to thunderous appaluse, they are the band of the hour and they know it. And he’s dead right of course and he’s played his cards dead right, the crowd give out a great cheer. It’s interesting how The Who escaped the ‘year zero’ of punk, we all detested Floyd, Genesis, Yes and the rest, but The Who were set-apart. Maybe it was their street-fighting credentials, maybe it was the wanton destruction of instruments on stage? Legs wide apart, arms wind-milling Pete blasts out The Who classics and we’re glad he didn’t die before he got old. Unlike his contemporary Eric Clapton, whos racist outbursts were the catalyst for the creation of Rock Against Racism, Townshed knows what’s what, he knows full well that his music, the music of the Mods, was born of a love of black music and he celebrates that. I walked stunned and dizzy out into the summer night of Finsbury Park. I find Mitch and Seamus and we swap war stories, we all have big grins on our faces. I hop on a bus heading back home. In many ways that summer was a huge turning point in my life. At the start of ’79 I was a shy, bullied boy with few friends. By the summer I had met two life-long punk mates and was about to meet a whole lot more. The bullies stopped their bullying once I hitched my ride on the punk roller-coaster, they thought the three of us as a new gang of weirdos, mistaking The Ruts scrawled on my school bag for the name of our gang. It was a long hot summer with plenty more gigs to come. Loved this Martin. I was one of the people who organised the benefits so thanks for posting.